If you have already made the mistake of installing a Typical, installation, rerun the executable installer you downloaded from internet, it will give you a Modify Button option. Running the install from Add/Remove programs will only give you the “Repair” option, which will do nothing for your problem. If you’re using Express, make sure you get/have a version that can compile for *C++, Desktop*. Godot’s source is hosted on GitHub. Downloading it (cloning) via Git is recommended. If you don’t see some of the shortcuts, “How the prompts actually work” section below will explain how to setup these prompts if you need them. “VS2013 x64 Cross Tools Command Prompt” will use a 32-bit cl.exe that will compile a 64 bit application. “VS2013 x86 Cross Tools Command Prompt” will use a 64-bit cl.exe that will compile a 32-bit application. This one is useful if you are running a 32-bit Windows. On a 64-bit Windows, you can run any of above prompts and compilers (cl.exe executables) because 64-bit Windows can run any 32-bit application. 32-bit Windows cannot run 64-bit executables, so the Visual Studio installer won’t even install shortcuts for some of these prompts. In general, it is OK to have at least as many threads compiling Godot as you have cores in your CPU, if not one or two more. Feel free to add the -j option to any SCons command you see below if you setup the “Pywin32 Python Extension”. Then copy one of these commands below for the corresponding tool you need into the “Path” and “Name” sections of the shortcut creation wizard, and fix the path to the batch file if needed. Visual Studio 2013 is in the “Microsoft Visual Studio 12.0” folder. Visual Studio 2015 is in the “Microsoft Visual Studio 14.0” folder. After you create the shortcut, in the shortcut’s properties, that you can access by right clicking with your mouse on the shortcut itself, you can choose the starting directory of the command prompt (“Start in” field). 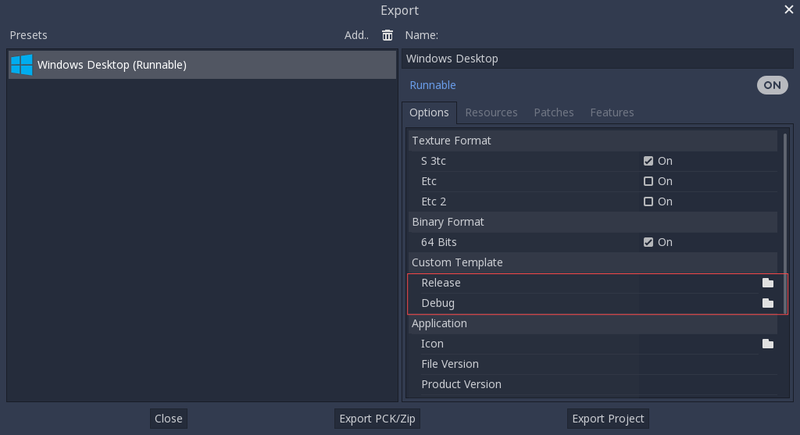 You will be able to open Godot’s source in a Visual Studio solution now, and able to build Godot via the Visual Studio Build button. However, make sure that you have installed Pywin32 so that parallel (-j) builds work properly. If you need to edit the compilation commands, they are located in “Godot” project settings, NMAKE sheet. SCons is called at the end of the commands. If you make a mistake, copy the command from one of the other build configurations (debug, release_debug, release) or architectures (Win32/x64). They are equivalent. You don’t even need to copy them, you can just reference the resulting files in the bin\ directory of your Godot source folder, so the next time you build you automatically have the custom templates referenced.